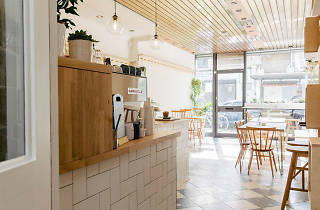 A clean and chic café in Walthamstow. 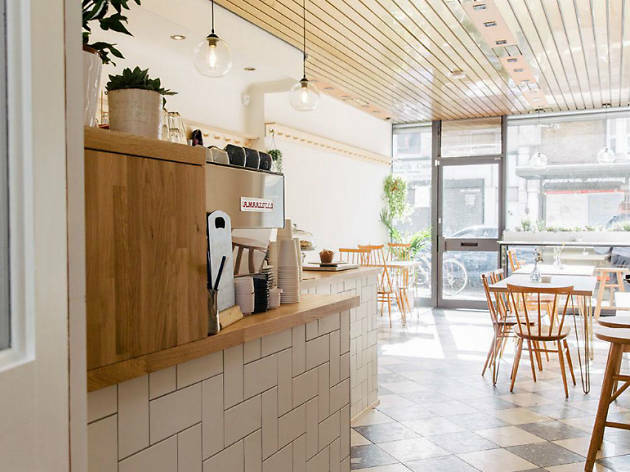 Buhler & Co is a serene, Antipodean-style (give or take a bit of Scandi-chic décor) little gem; a brunch beacon for the baby-laden denizens of Walthamstow. It’s also renowned in the area for its coffee, which is made with Climpson & Sons beans and available in steamy and iced versions (and also via a V60 pour-over, so they know their stuff). Milk, if that’s your thing, is from The Estate Dairy, and good providence abounds across the sodas, booze and excellent veggie/vegan food menu. Such relentless wholesomeness can be a drag, but Buhler & Co makes a serious case for the good life. Bright and stylish daytime cafe specialising in imaginative meat-free cuisine, speciality coffee and house baked sweet treats. I've been here twice for breakfast/brunch and recommend it on a weekday morning when it is peaceful! On a Sunday midday it is manic, large tables with kids and babies everywhere and lots of noise! The staff also struggled to cope with our order, wouldn't swap a poached egg with scrambled and items were missing off plates when serving us. The consistency of dishes weren't great on this busy day either, three of us had the baked eggs and they weren't all the same quality - one was watery but we couldn't face calling the waitress back again. All this aside, the all vegetarian menu is a delight and there's still more on there I want to try. The veggie fry-up is extremely satisfying although I'd suggest the paratha is too much (if completely unnecessary!) and more a form of puff pastry. The food is a talking point and the cafe itself is simple with a lovely outdoor/indoor space at the back. Even the meat eaters of the group seemed pretty happy once they'd eaten their meals as I think they were (sadly) a little daunted by the meat free menu whilst hungover! I'll be back, but sadly Buhler didn't wow me like I had expected it to. The owners of Buhler and Co have brought trendy vegetarian dining to Walthamstow. Can you please take me back here please? We came here for brunch on a Sunday and the food was incredibly presented and delicious. The meals are a little above average price but you sure do get your moneys worth. The staff were friendly and the atmosphere is light and airy! I'd highly recommend this hidden gem! The food here is so good, I keep going back to try more from the menu. The veggie fry up is really good, perfect weekend breakfast fodder. Stand out dish for me was their spätzle with pea and truffle, everything I've had is really tasty. Super high standard for presentation and flavours. Well priced, delicious and innovative food in a beautiful setting To top it off lovely friendly service. A real gem! They've got this just right. Airy, clean, relaxing, top notch coffee and food. The food and service, including the ambience is excellent. They made me like Quinoa, something I never thought would happen! The Buhler girls have brought a whole new level to vegetarian dining and, in my humble opinion, put Walthamstow on the map as one of the coolest areas to eat in London! Their antipodean menu is nothing short of remarkable- each and every item on there causing you to salivate and, well, let's not even get me started on their cocktails! Heaven!! Wow, a delight from the moment you step through that door- could not rate it highly enough!! the staff are fantastic and the coffee immense! Exceptional quality ingredients and mouth-watering food served without the fuss! The Kiwi sisters clearly put a huge amount of time into the design and feel of the space (they tell me this is their first cafe, but it seems like second-nature). With a menu led by vegetables, they satiate local bellies that have gone neglected for years. You have to try the soba noodle main and their cinnamon buns..don't get me started on the Climpson coffee brewed by their lovely team! Amazing vibe, super friendly staff, and delicious food. Amazing food. Brilliant service. Beautiful interior. Really inspired vegetarian cooking (not just smashed avo on toast) great coffee and super friendly service from the Buhler sisters and staff. The food, the atmosphere and the coffee are the best !! A great place to grab a bite to eat. Happy staff and great food. Looking forward to my next trip there. Probably best coffee in Walthamstow- the baristas take coffee seriously. Not eaten meals there but good cake. Friendly staff. Great addition to Walthamstow. Amazing brunch and menu, vege inspired and on top of that really great service. If you want Insta-friendly brunch options that taste better than they look this is the place to visit!